When we purchased our hunting property a year ago, we hoped that there would be enough game to meet our needs. That translates to “fill our freezers”. The place had been over-hunted for sure. But it was a decent size for us, was easy to get around on, and was covered with ancient oak trees with enough mesquite to flavor all our smoked meat. It was a beautiful piece of land and it was ours. This past spring, we heard some turkeys off in the distance one evening. We weren’t even certain they were on our property. Sure enough, while walking around the next morning, we spooked one right in front of our little casita. Immediately, we discovered that she had been sitting on a nest of eleven eggs! Apparently, we were gonna have our very own flock of turkeys! Images of Thanksgiving turkey and dressing, turkey pot pie, trash can turkey, and turkey stock to make turkey soup (I use my pheasant soup recipe.) filled my head. I was ready to make room in the freezer for some turkey. Several months passed before we had another chance to get to the ranch. Fast forward to September and October. We had feared that the eggs might have fallen prey to a pair of foxes that resided nearby. It was time to start getting ready for hunting season. We headed up ready to get to work. While driving around the property, I spotted a flock meandering around in the shade of the oak trees. It appeared that most if not all of the eggs had hatched. I was so excited. It’s kinda funny. I don’t really have any helpful hints or recipes for this post. I just wanted to share something that brought me so much joy and made me so happy. Not too many years ago, I wouldn’t have been caught dead driving around a ranch in a pickup truck. Or spent days cleaning mouse poop out of a very rustic hunting cabin. I was content to send my husband off hunting while I shopped and, well, didn’t go hunting. I’m not really sure what changed. Now, I can’t think of any place I’d rather be than on that ranch, listening for turkeys. Well, friends, I’ve really dropped the ball this time. The opening of whitewing season has come and gone in South Texas and I didn’t post any acknowledgement whatsoever. Not a recipe, a “let’s get ready”, or a “good luck hunters”. Sometimes things get kinda hectic and life just gets ahead of you. Sometimes it turns around and laughs while you try to catch up. I can only hope that you checked out some of my previous posts; A Thing or Two About Game Birds, It’s Here! 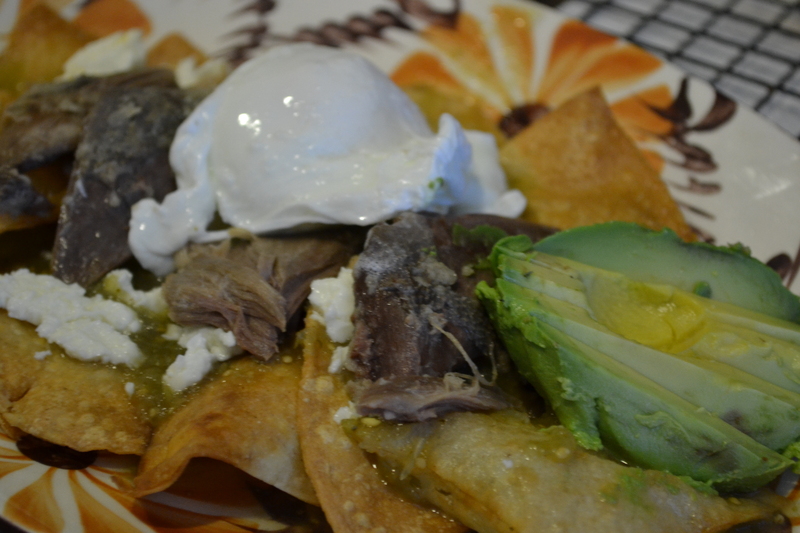 Whitewing Season!, Roasted Corn and Poblano Soup with Whitewing Dove Breast, and Chilaquiles with Whitewing Breast. The funny thing is that Deerslayer went on a dove-hunting trip in Argentina a while ago and brought back a recipe that he was served one evening after the hunt. He liked it enough to ask the chef for the recipe so that I could prepare it for him at home. Here it is. Add in garlic, red bell pepper (optional), dove breasts, dried thyme, red pepper flakes, and a ¼ cup of white wine. You may need to add some more wine during the food processing to get the correct consistency. Transfer mixture to your food processor, in batches if you have a food processorette like I do, and process until everything is finely chopped and holds together. This is when you can add more white wine if the mixture is too dry to hold together. 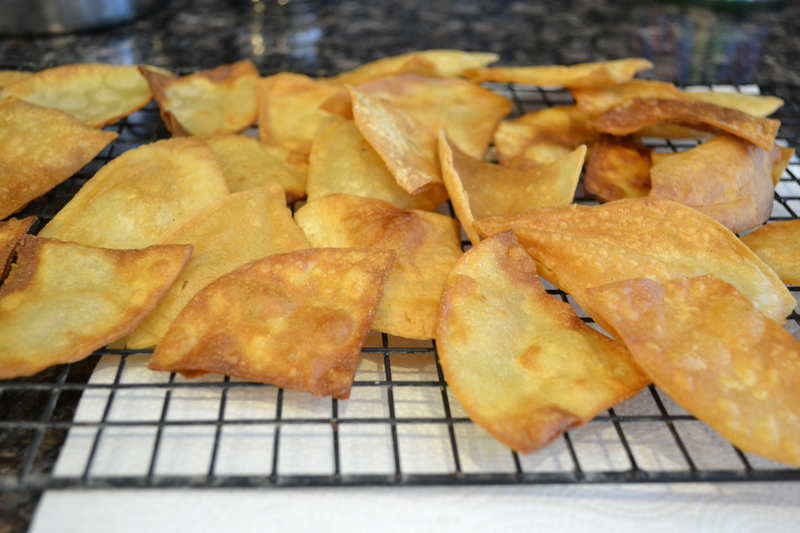 Next, separate and lay out the wonton wrappers. Wonton wrappers are pre-rolled, pre-cut sheets of pasta used for, you guessed it, wontons. All the work has been done for you. They make this recipe so much more feasible for the busy hunter and family. Wonton wrappers are readily available in most grocers in the produce section. Place about 2 tsp. of the dove mixture into the center of each pasta square. Paint a scant amount of the beaten egg around each ravioli to “glue” the two pasta squares together. Carefully press the squares together, being careful to press as much air as possible out of the center. Bring about a gallon of water to a rapid boil in a large pot. Add some salt and a glug of olive oil. Add the ravioli, a few at a time to the pot. They will sink at first, then will rise to the top. This will only take a minute or two. You may remove them to a plate with a slotted spoon or a spider, like the one pictured. 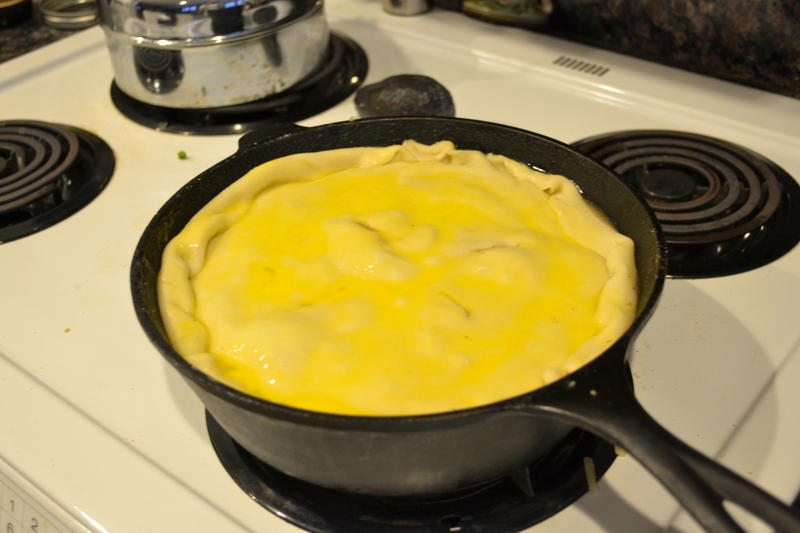 In a separate pan over medium heat place the butter until it just starts to brown. 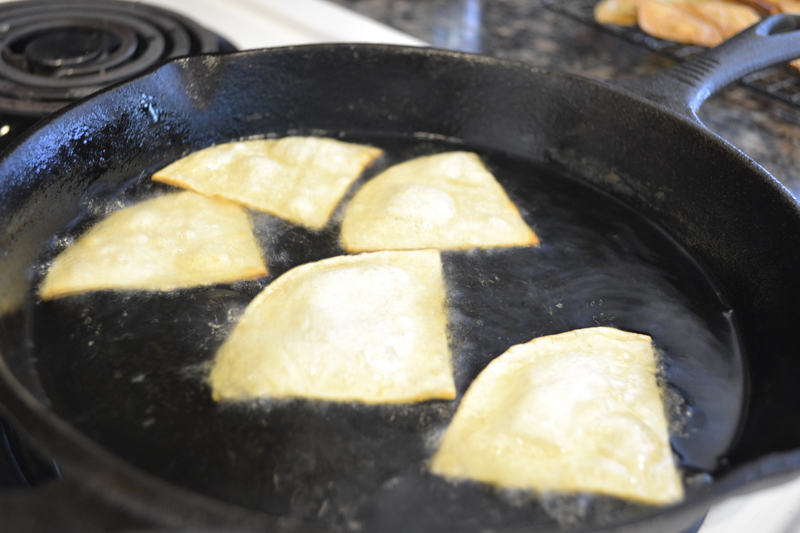 Toss in a few ravioli until coated and slightly browned around the edges. Remove to a plate. Drizzle browned butter over the plate of ravioli. Sprinkle with chopped Italian parsley, remaining parmesan, and pine nuts. You may be wondering what whitewing season has to do with chocolate cake. If you bear with me for a few minutes, not only will the connection become clear, but you’ll end up with a fabulous chocolate cake recipe as well. Preparations had begun for the first big whitewing dove hunt of the season. Members of the Deerslayer (hopefully whitewing slayer) Clan would soon be converging on the southernmost part of Texas where the hunt would take place. All the accouterments necessary for the big weekend began to pile up in the front hallway; Yeti coolers, folding chairs, shotguns, gun cases, boxes of shells, shooting vests, all varieties of khaki and camo attire, boots and muck boots, plenty of thirst-quenching beverages, shears. The pile grew and grew. I could no longer get to the laundry room. As the pile began to encroach on the surrounding environs, the Deerslayer’s wife developed an ever-so-slight twitch. The twitch was accompanied by a bout of crankiness. Don’t get me wrong, my mantra is “Go with the flow, embrace the moment.” However, I also like a tidy house. I’m guessing that the extensive paraphernalia that is part and parcel with the hunting way of life might be one aspect that makes a deerslayer’s wife wince. However, it’s important to remember that the planning and preparation are part of the thrill of it all. 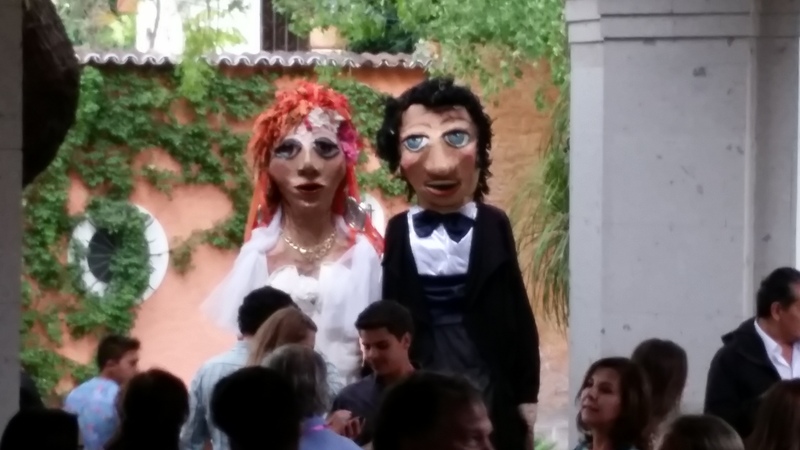 It was time for me to step back, take a deep breath, regroup…. 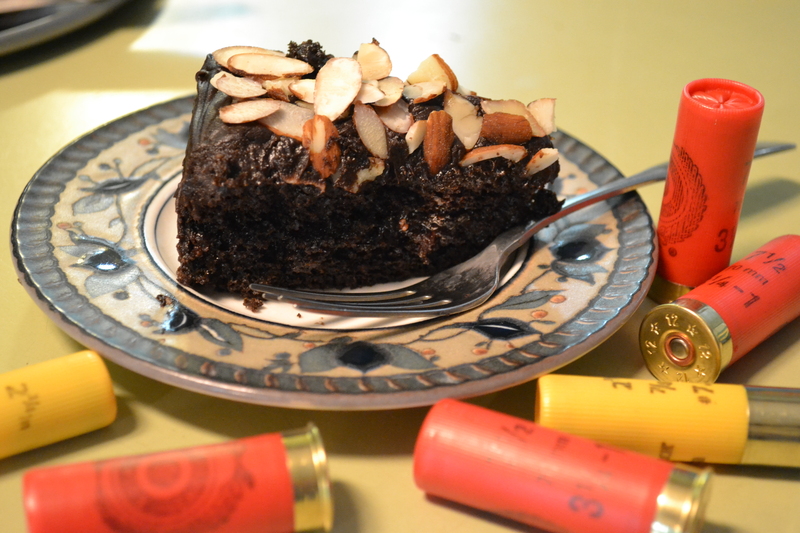 and bake a nice chocolate cake for the hunters to take with them. A small, thoughtful gesture like that can bring a tear of gratitude to any hunter’s eye. And it provided me with a creative outlet on which to refocus my energies. 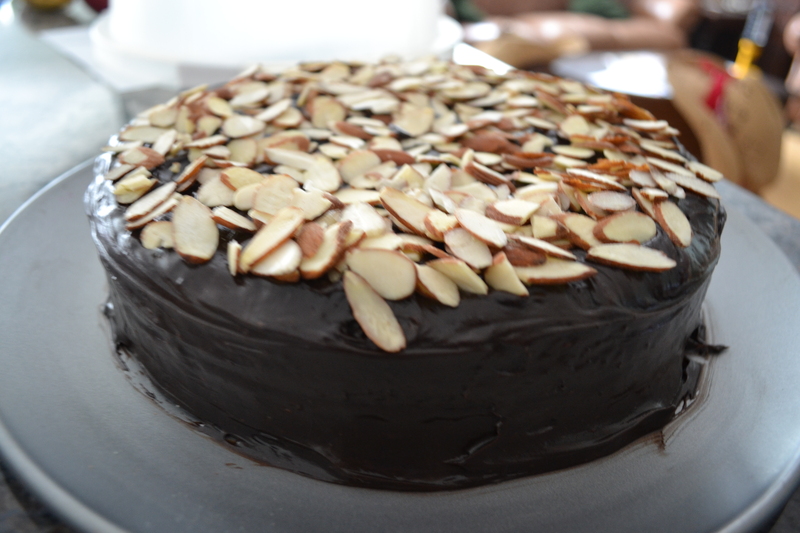 I discovered a great recipe on the King Arthur Flour website a few weeks ago when I was scouring the internet for a chocolate birthday cake for one of the Junior Deerslayers. Cake Pan Cake was just what I was looking for. While I love to cook all sorts of wild game, baking has never been my forte. 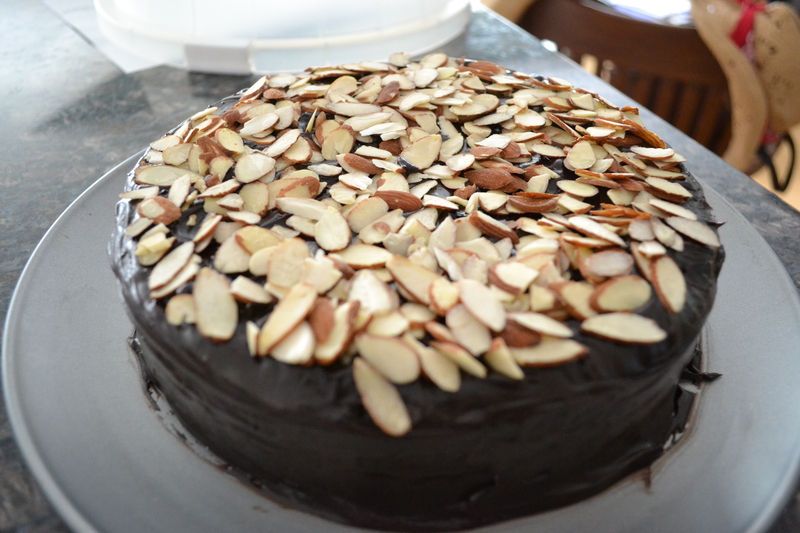 This recipe is just what I needed; rich, moist, chocolaty, and EASY! This fabulous cake was well received It even has a backstory; hearkening back to WWII and the days of rationing. The original recipe has no dairy or eggs and is supposed to be mixed together in the baking pan. Check out the website for the original recipe and its history. I adapted the original recipe a bit and the results were delicious. My dry ingredients. 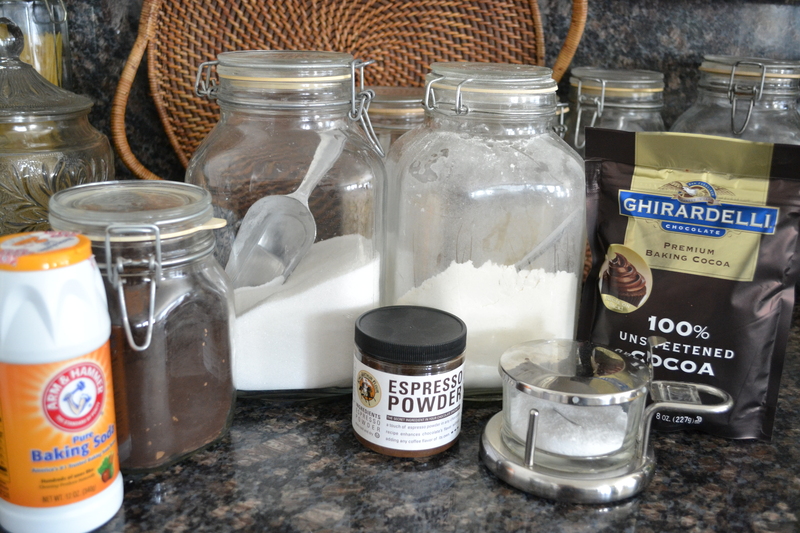 Black cocoa powder and espresso powder were ordered from King Arthur website. My liquid ingredients. I used half & half in place of water. The bottle on the far right is vanilla and not beer! Everything is better with a layer of raspberry jam. The prepared frosting worked perfectly well. 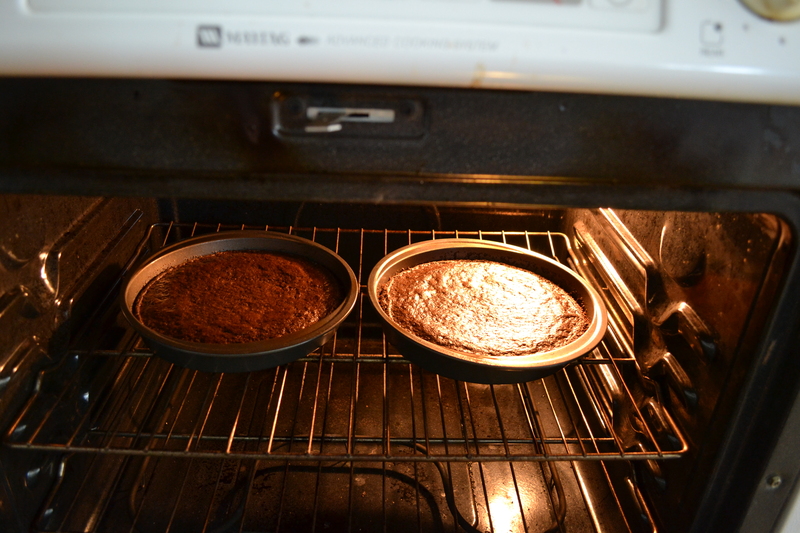 And almonds (or pecans or whatever)…..
Preheat oven to 350 degrees. 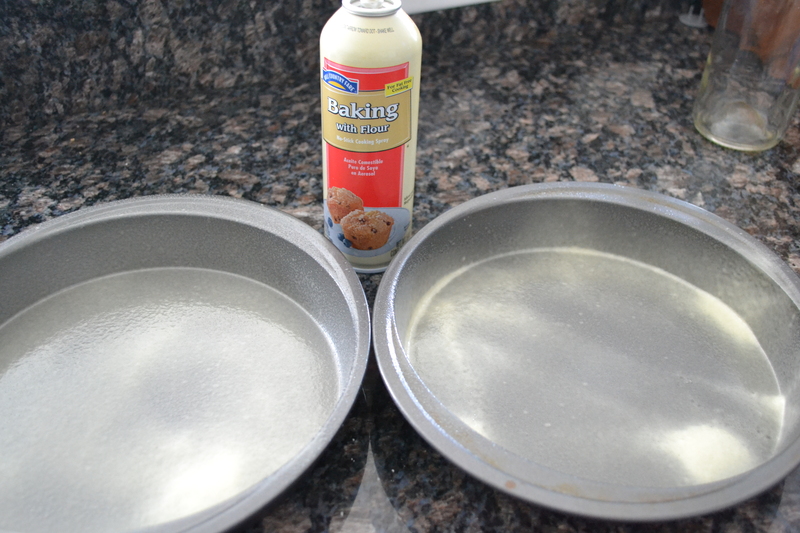 I used two 9″ round pans and sprayed them with baking spray with flour. 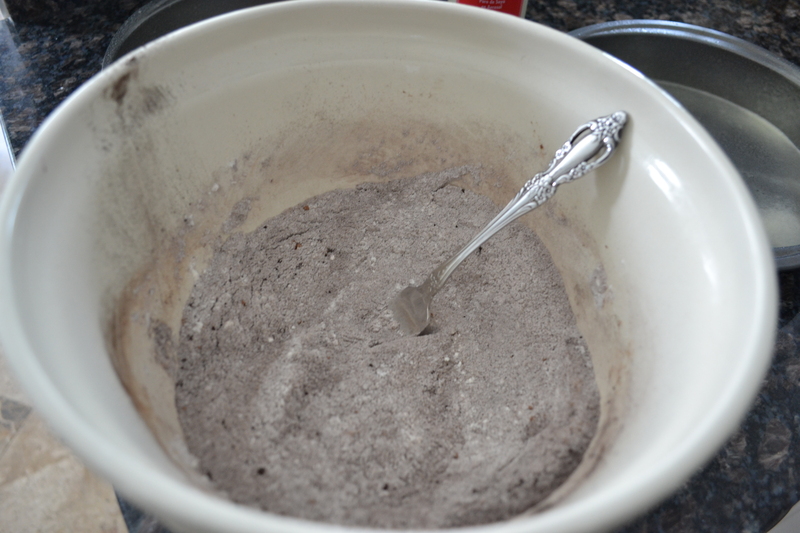 Combine all dry ingredients in a bowl. Stir around with a fork until mixed. In a two cup measure, combine all liquid ingredients. Pour into dry ingredients and stir until well mixed. 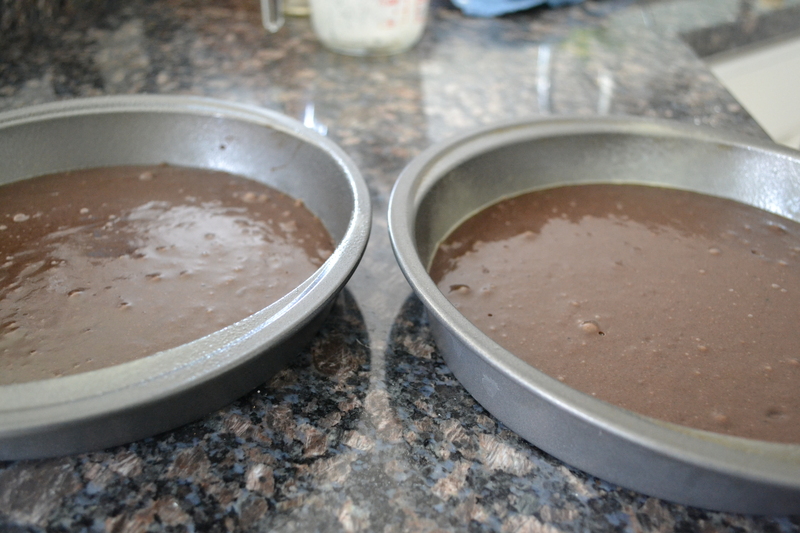 Divide mixture equally into two round pans. It will barely cover the bottom of the pans. Bake for approximately 20 minutes (less than the time listed on the original recipe since I divided the batter into two pans). Check for doneness around 20 minutes. All ovens differ. Remove pans from oven and cool on a rack.When cool, smear as much raspberry jam as your heart desires atop one of the layers. Place the top layer where it goes (on top). Frost the cake, lick the spatula. 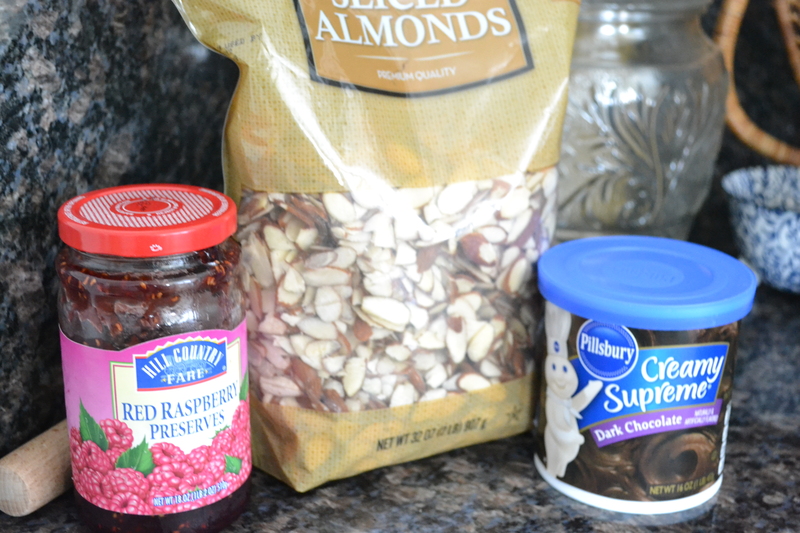 Sprinkle with slivered almonds. Eat some. Sneak some more frosting. Enjoy. This post is dedicated to my favorite chocoholic fiends: Junior Deerslayer and Kelly! 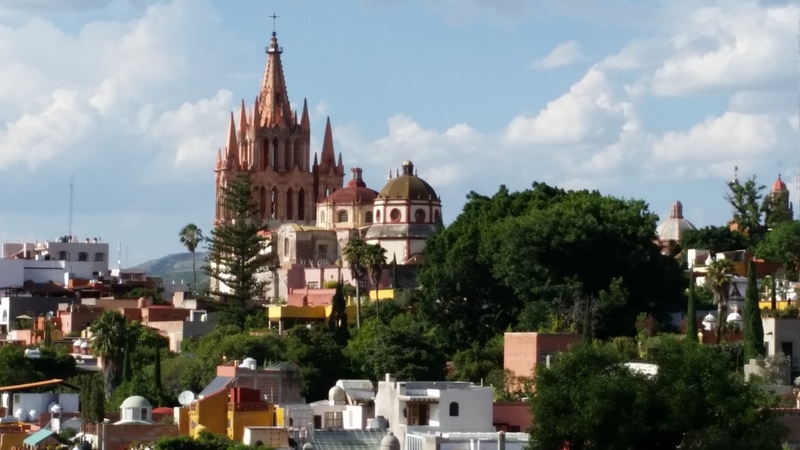 Deerslayer and I had the opportunity to travel to San Miguel de Allende, Mexico in June.The son of our dear friends was getting married and we headed down to attend the wedding The small town was beautiful. 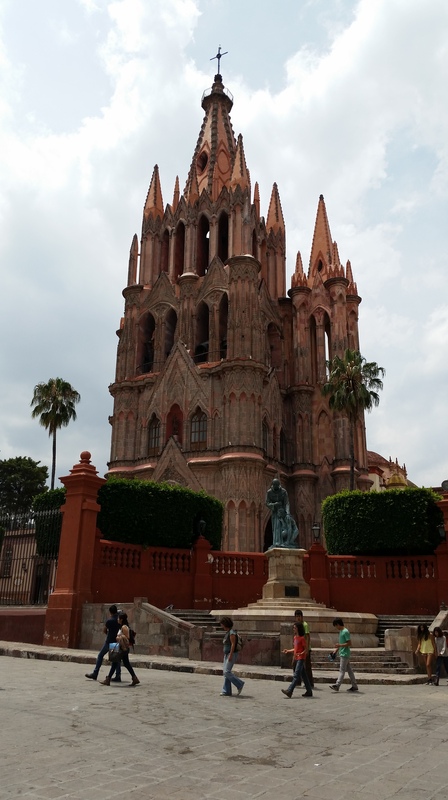 Cobblestone streets, breathtaking cathedrals, wonderful traditions, fabulous food, great shopping. We spent five days and would like to go back again. 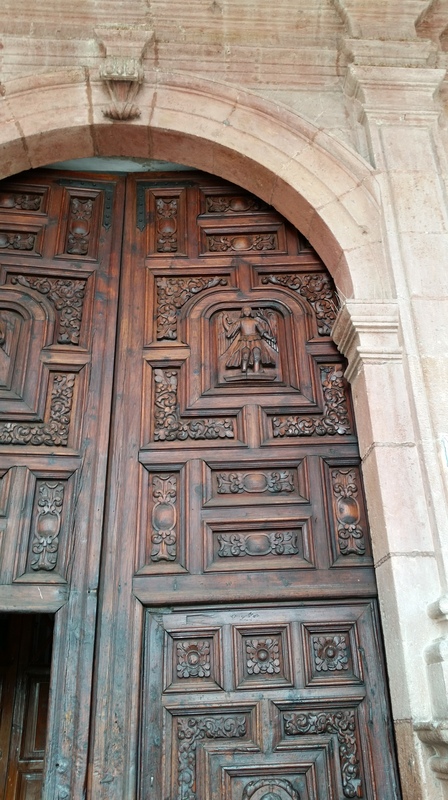 There were many terrific restaurants, some with traditional foods, some with cutting edge cuisine. While I loved both, one of the traditional breakfast dishes really stood out in my mind…so much so that we went to the same restaurant twice and ordered it both times. Deerslayer and I had chilaquiles, originally a breakfast for the working classes, a way to use day-old corn tortillas, softened with salsa, flavored with leftovers, usually chicken, some cheese, some crema fresca. A poached egg was added atop the recipe we had. The great thing about this recipe is that, to the basic corn tortillas and red or green salsa, the extra additions are as limitless as your imagination. 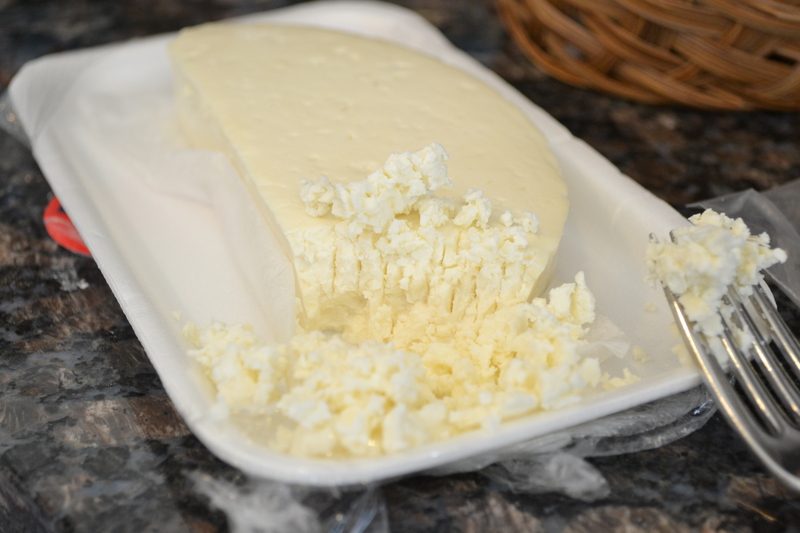 Cheeses, onions, cilantro, varieties of meats, eggs (fried, poached, scrambled) and avocado are just a few examples. 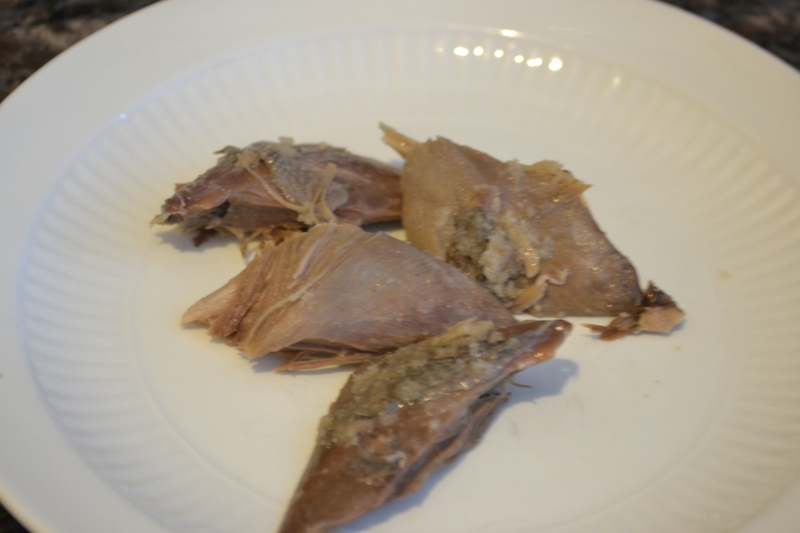 To bring a wild game aspect to the recipe, I substituted some leftover whitewing breasts,for the chicken, to create a special occasion breakfast. Don’t freak out! You do, in fact, see venison tenderloIn rather than whitewing breast, in this photo. I actually prepared the whole thing twice, once with venison (recipe soon) and once with whitewing, since it’s almost whitewing season in this neck o’the woods.The second time I whipped up the recipe, I used leftover whitewing breast, already cooked up from a meal the previous evening. 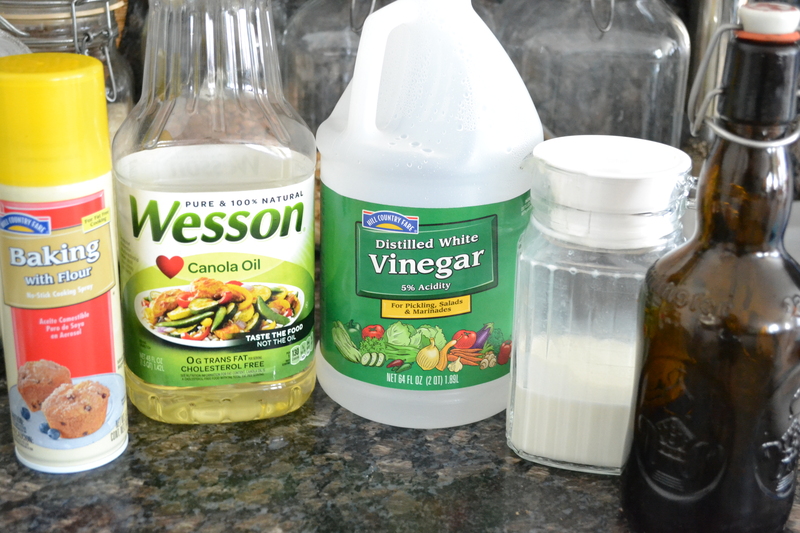 In a cast iron skillet, add about a half inch of corn oil and bring to medium high heat. 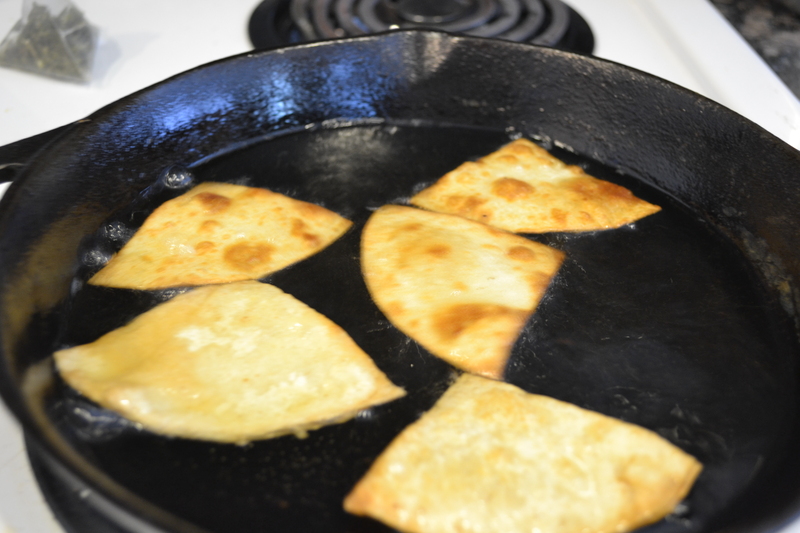 Add quartered corn tortillas, one at a time, and fry until just brown around the edges and slightly crispy. 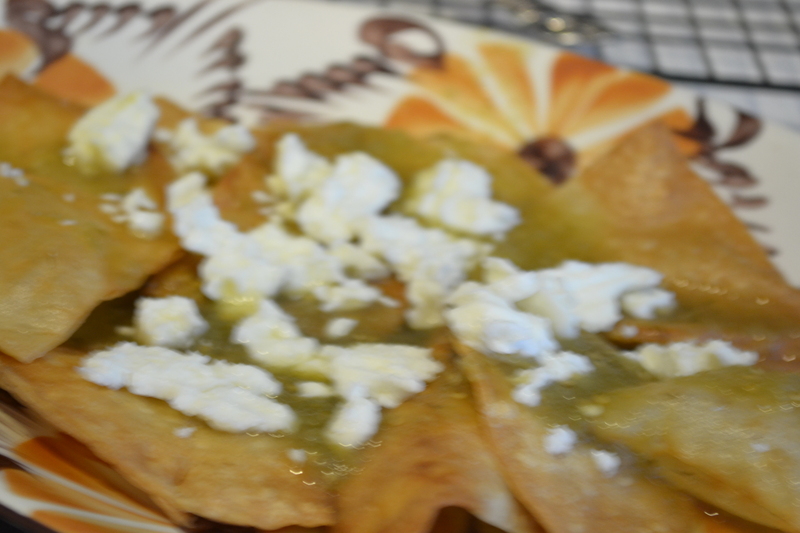 The chilaquiles that we had in San Miguel were made with a green salsa, tomatillo, to be exact. 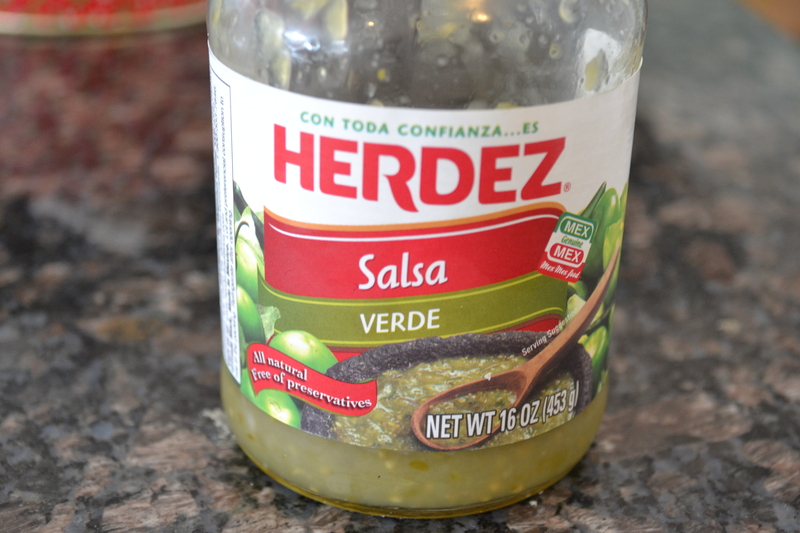 The dish can also be made with salsa roja (red sauce). 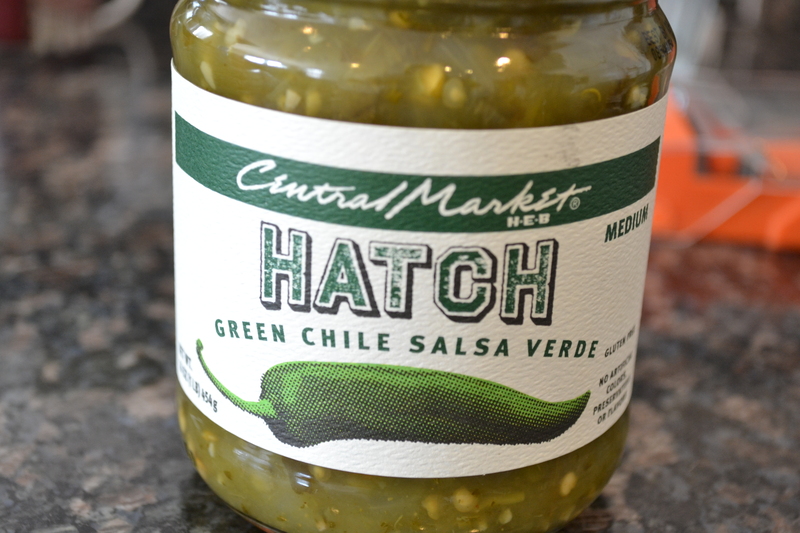 Hatch chiles also would work beautifully. Poach your eggs. Set aside on a plate once they are cooked the way you like them. You don’t want them overcooked. Arrange a pile of chips on each plate. Pour salsa over the chips. Crumble cheese and drizzle crema over chips and salsa. Arrange whitewing breasts and poached egg atop the pile. Add cilantro and avocado for fun. The assembly of the dish was rather complicated since I was making four servings. 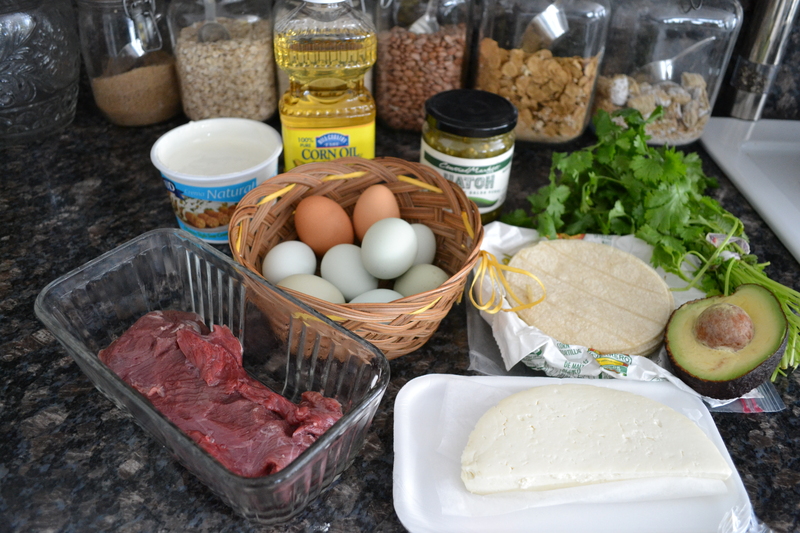 The second time I prepared it, after frying the chips and poaching the eggs, I set out the chips, heated salsa, crumbled panela cheese, whitewing breasts, poached eggs, crema fresca, avocado, and cilantro. Everyone built their his/her own plate, adding as much or as little of the ingredients as they desired. This method was much easier for serving several people. 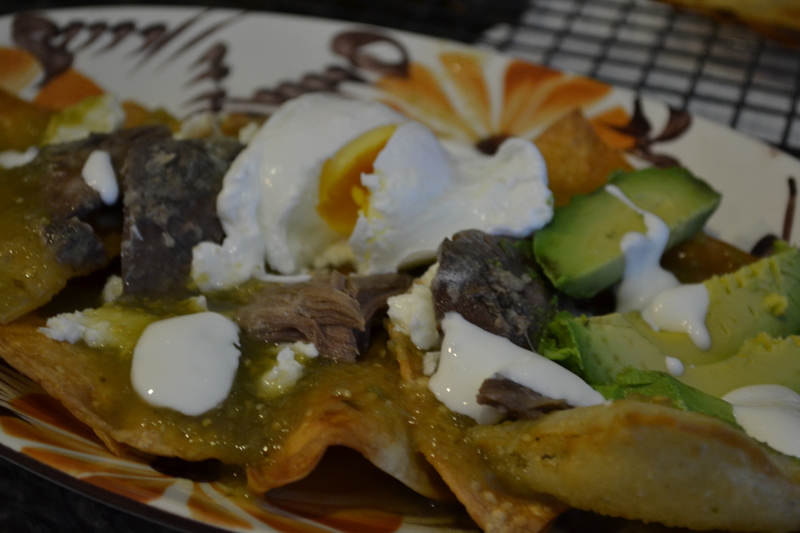 If you are serving this fabulous dish to first-timers (people who have never had chilaquiles before) just take the bull by the horns and show everyone how it’s done. They’ll get the hang of it. 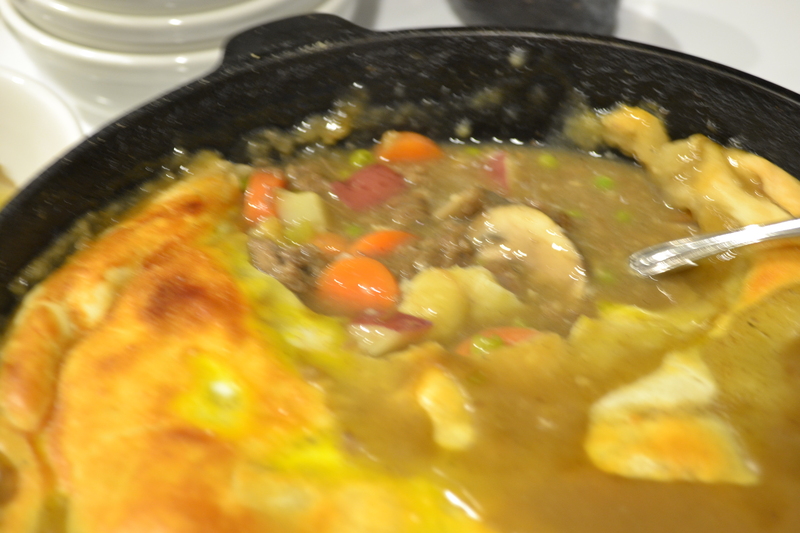 There are certain times when a savory meat pie hits the spot like nothing else. I have no doubt that Sherlock Holmes would eat a delicious meat pie. 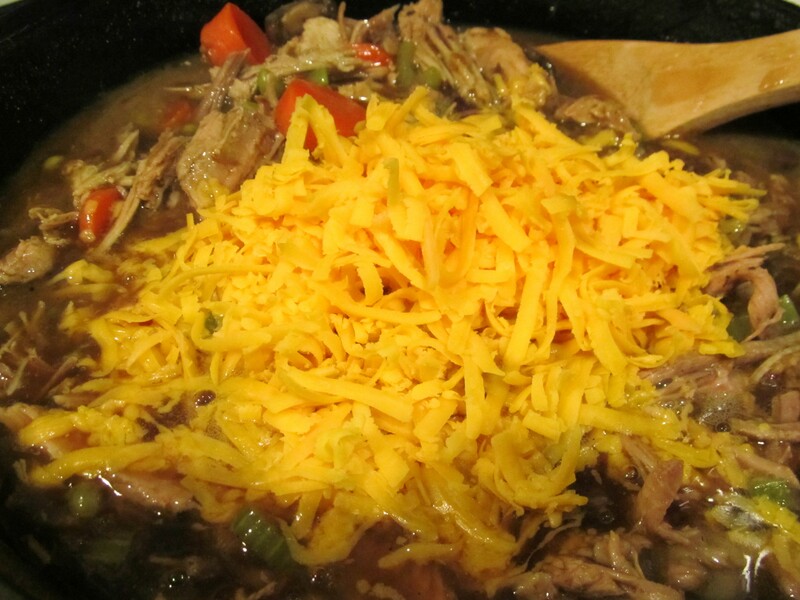 Make it with wild game (venison, elk, nilgai, wild pork) and it can’t be beat. The ease with which this dish is prepared makes it perfect for leftover turkey, chicken, goose, or pheasant as well. It has become my go-to recipe when I’m looking for something rich, delicious, and healthy that can be made with any leftover meat (or cooked-all-day game), veggies and a yummy crust. This picture does not include potatoes or pie crust. Oops! The bowl of small, red orbs is actually pearl onions. Use ’em or don’t as you like. 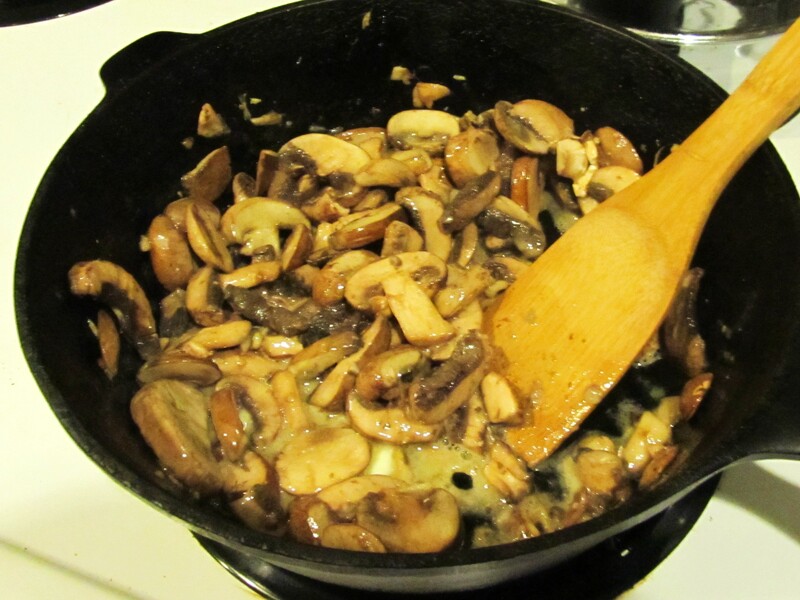 In heavy cast iron skillet, saute mushrooms in butter & olive oil. Season with Tommy’s salt & pepper mix. In another sauce pan, bring stock to a boil. Add carrots, celery, and fresh, peeled pearl onions (or frozen). Cook until tender. Add potatoes. Cook for another ten minutes. 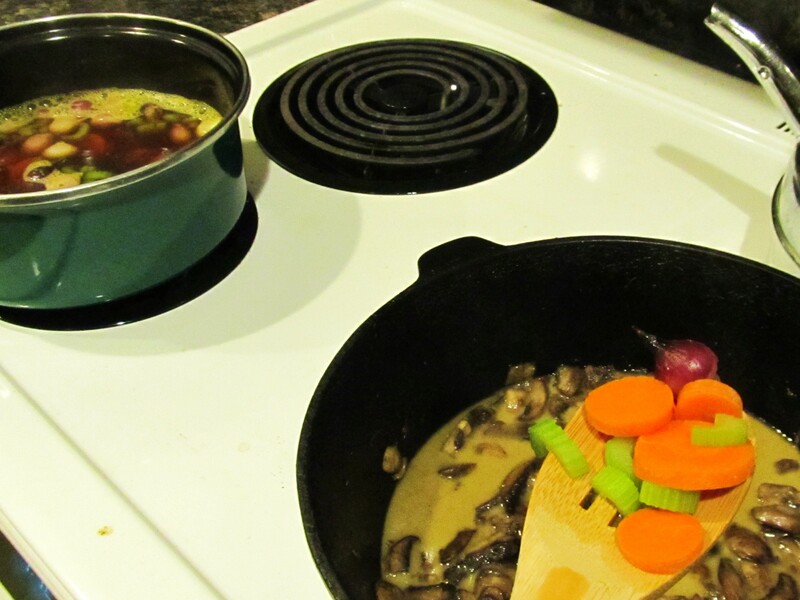 Using slotted spoon, transfer veggies to skillet with mushrooms. Toss in peas and shredded or cubed meat. Return stock to heat, reserving 1/2 cup. 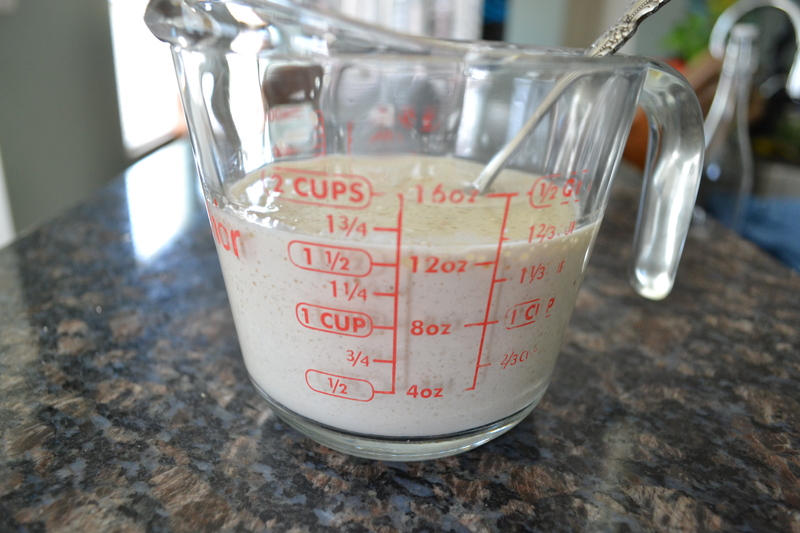 Add the 1/2 cup and cornstarch to a jar, seal and SHAKE, SHAKE, SHAKE. Add Guinness and stock-cornstarch mixture to remaining beef stock. Boil on medium heat until thickened. Pour all into cast iron skillet and heat through. Season with kosher salt and fresh-ground pepper. Stir in grated, awesome cheese. For days when I don’t feel like making crust from scratch, I lay a ready-made crust over the top of the ingredients. Cut slits to let steam escape, roll the edges for a popular rustic appeal, and paint top with an egg wash.
Bake for 35 minutes at 350 degrees until crust is golden. Easy Peasy! Once again, you have maintained your title of “Hunting Queen/King of the Universe”. Oh, by the way,…… I almost forgot to share my goose hunting experience. The junior deerslayers and I decided that we wanted to “go Victorian” for Christmas this year. Christmas goose was going to be the star of the show. Figgy pudding would provide the grand finale. Since we had just had a typical South Texas thanksgiving with turkey, cornbread dressing, and such, we were in the mood to shake things up a bit. So I began the hunt….. to the local grocers. 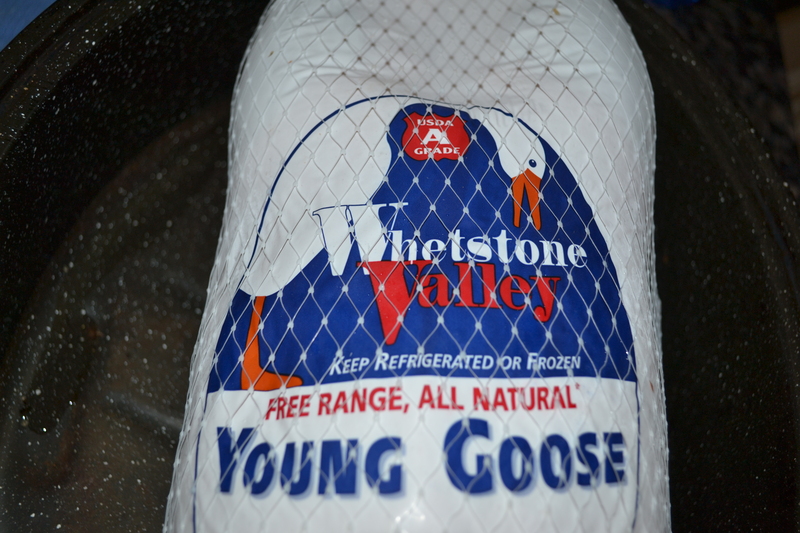 Clearly, goose is not only NOT a tradition in these parts, I had to spell it out to several local butchers. When I say “spell it out”, I’m talkin’ G-O-O-S-E spelling it out. Don’t forget, goose is not traditional fare for this area. Finally, after several days of hunting, I spotted my prey. Stealthily, I crept up to the unsuspecting flock, in the frozen food aisle. No hurry, though. 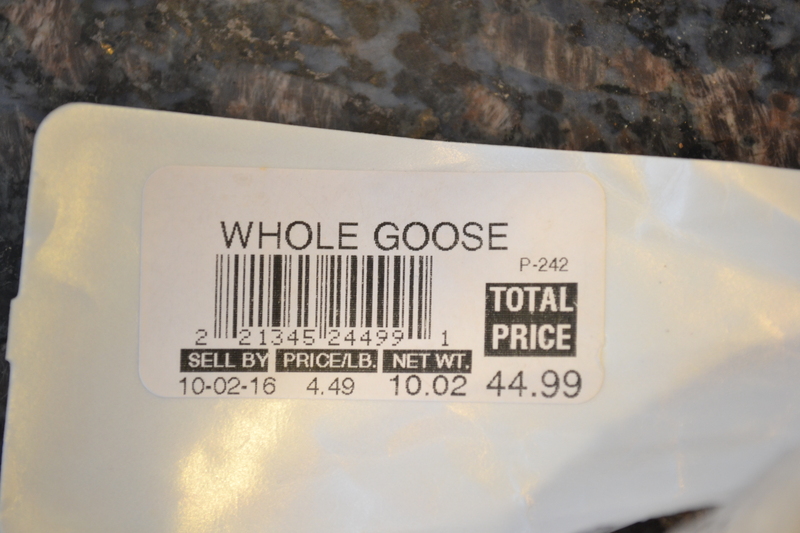 Remember that no one else in this neck of the woods was in the market for a goose. I had my pick. The grocer seemed strangely proud of these birds that aren’t part of the local customs. Perhaps, since they are exotic, they fetch a premium price. By Texas standards, the price was high, but the experience, in my mind, would be priceless. I followed the instructions, piercing the skin all over to allow the fat to render out of the bird while it cooked. I cut away the extra fat around the opening to the cavity. 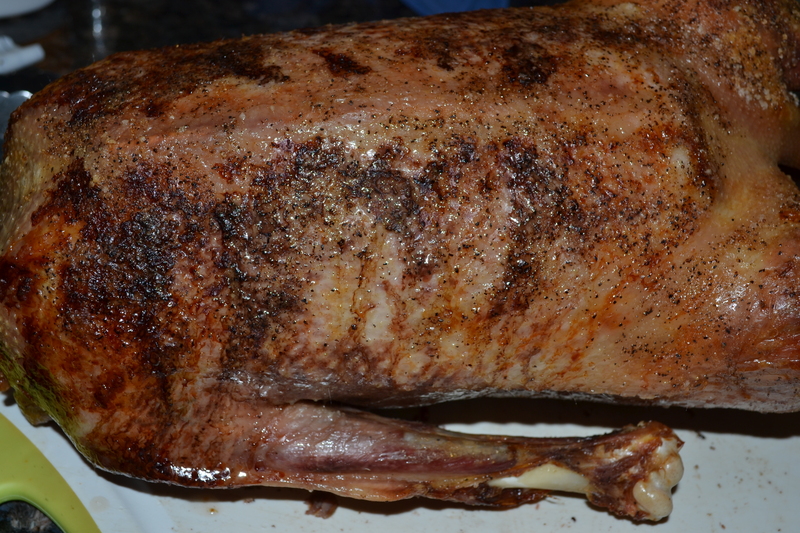 Domestic goose, while very juicy and pretty much all dark meat, needs to have the fat drained away from the meat. Our ten-pound bird rendered out over a quart of fat. I have to say, though, that a little goose fat, some rich drippings, giblets, and neck meat produced an amazing gravy that we served with garlic mashed potatoes, broccoli-rice casserole, and peas. The meal was finished off with a delicious figgy pudding, the likes of which have never been experienced in South Texas. I don’t know how authentically Victorian the meal was but it was tasty and we enjoyed it. All was right with the world. Next year, turkey. Or nilgai! Perhaps domestic goose is a little “highfalutin'” for a Texas gal and her family.